Qt Quick in Plasma Workspaces -- Qt Quick is continuing to make its way into the Plasma Workspaces; the Qt Quick Plasma Components, which were introduced with 4.8, mature further. Additional integration of various KDE APIs was added through new modules. 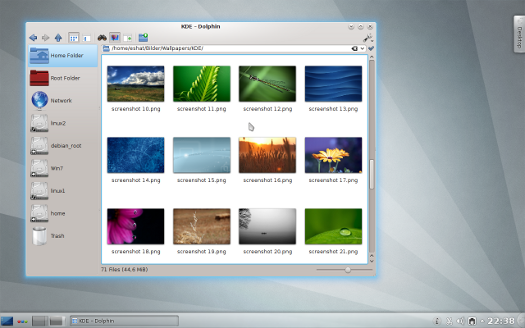 More parts of Plasma Desktop have been ported to QML. While preserving their functionality, the Qt Quick replacements of common plasmoids are visually more attractive, easier to enhance and extend and behave better on touchscreens. The Dolphin file manager has improved its display and sorting and searching based on metadata. Files can now be renamed inline, giving a smoother user experience. Deeper integration of Activities for files, windows and other resources: Users can now more easily associate files and windows with an Activity, and enjoy a more properly organized workspace. Folderview can now show files related to an Activity, making it easier to organize files into meaningful contexts. Many performance improvements and bugfixes improve the overall user experience, making KDE Applications and Workspaces more productive and fun to use than ever before. More improvements can be found in the 4.9 Feature Plan. As with any large number of changes, we need to give 4.9 a good testing in order to maintain and improve the quality and the user experience when they get the update. Therefore, in tandem with this first 4.9 beta, we also announce a testing initiative led by KDE's Testing Team. The KDE Community is committed to improving quality substantially with a new program that starts with the 4.9 releases. The 4.9 beta releases of Plasma Workspaces, KDE Applications, and KDE Platform are the first phase of a testing process that involves volunteers called “Beta Testers”. They will receive training, test the two beta releases and report issues through KDE Bugzilla. Today KDE released updates for its Workspaces, Applications, and Development Platform. These updates are the third in a series of monthly stabilization updates to the 4.8 series. 4.8.3 updates bring many bugfixes and translation updates on top of the latest edition in the 4.8 series and are recommended updates for everyone running 4.8.2 or earlier versions. As the release only contains bugfixes and translation updates, it will be a safe and pleasant update for everyone. The report of KDE e.V. for the fourth quarter of 2011 has been published. It gives an overview of the activities KDE e.V. supported in the last 3 months of last year. The report has a message from the President of the Board reflecting on the first 15 years of KDE and looking forward to more opportunities. There are stories about exciting product announcements and the various sprints that produced exceptional results. Today KDE released updates for its Workspaces, Applications, and Development Platform. These updates are the first in a series of monthly stabilization updates to the 4.8 series. 4.8.1 updates bring many bugfixes and translation updates on top of the latest edition in the 4.8 series and are recommended updates for everyone running 4.8.0 or earlier versions. As the release only contains bugfixes and translation updates, it will be a safe and pleasant update for everyone. KDE’s software is already translated into more than 55 languages, with more to come. The March updates contain many performance improvements and bugfixes for applications using the Nepomuk semantic framework.